Coming up on FOUR YEARS post Cancer, when I saw this book on my ebookhabit.com email I immediately added it to my reading list. Now, I won’t read it right away (I have to be in the right mindset to read “tearjerkers) but It sounds like it might be a wonderful book for ‘literary tearjerker lovers! Adam Spencer, a happily married 37 year-old father of two young boys, has everything he wants. A successful business, a beautiful home, two cars in the garage, and a dog. What he doesn’t want is to die. But Adam doesn’t have a say in the matter. He just found out he has brain cancer. Troubled by his newly-discovered death sentence, Adam joins a support group for the terminally ill. There, he meets six strangers who are struggling to cope with their own impending demises. When one member of the group dies, leaving behind an unfulfilled dream, the others realize just how limited their time is. Now, as the youngest member nears the end of his short life, they become determined to make sure the boy’s dream comes true before it’s too late. Together, they embark on a road trip that will teach them all what it means to live, and to die. Tragedy and loss are sounds. The slip of waves across rock. The cry of a loon across a dark lake. The patter of rain against midnight windows. They are water, streaming from here to there, giving life. And taking it away. His mother, Paulina, circus performer, fortune-teller, magician’s assistant, and mermaid, walked into the water when he was seven. His father soon followed, destroyed by grief. And only Simon, and his baby sister Enola, remain. Simon, a lonely young librarian, who clings to the home he grew up in, which itself clings desperately to the edge of the cliff above the sea, falling to wrack and ruin, a mere memory, a ghost of the warm family home it once was. Simon, who lives alone while his sister, like her mother before her, lives the life of the circus, the carnival, reading the fortunes of the lonely, the lovelorn, the lost. But then, the book arrives. And time begins to waver, back and forth through time, the past melding with the present through the words of yet another “walking shadow, a poor player, that struts and frets his hour upon the stage, and then is heard no more.”* A poor player indeed, who struts and frets across a traveling carnival stage. There is magic here. Magic and pain and loss and death. Simon’s tale reaches back, back to Hermelius H. Peabody’s Portable Magic and Miracles Traveling Show. Hermelius H. Peabody, self-proclaimed visionary in entertainment and education. Hermelius H. Peabody, who one day comes upon a real Wild Boy – a Wild Boy who was left in the woods to die, and instead lives – lives, and learns to listen to the water. Learns to vanish. 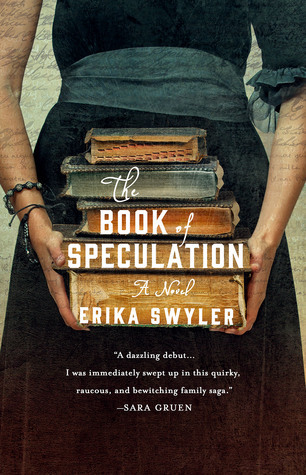 “The Book of Speculation” is a small miracle. History and mystery, mysticism and the water. Always, always the water. A lost book, a lost soul. A lost history found, beliefs crumpled. And the water sings, its quiet song of death. I received “The Book of Speculation” from the publisher in exchange for a realistic review. All thoughts are my own. If we keep working at it, we can certainly become Venusian. All we have to do is continue the path we have begun. Global warming, climate change, worldwide drought. Yes, we are on our way to destruction, up the proverbial creek without water. And water is what this story is all about. Honestly however, in a way it reminds me of those stereotypical 1950’s era monster movies. The Creature From the Black Lagoon, The Beast From 20,000 Fathoms, Invasion of the Body Snatchers. Nuclear weapons were the fear then. And yes, they were worth being terrified of. But as horrifying as they are – this is a situation that it is hard to see any way out of. Worldwide drought is becoming more and more feasible as a worldwide outcome of our continuing greed and carelessness. And The Water Knife has a good premise. However, its problem is that of being written more like a script for a B movie rather than a well-written novel. The stereotypes are a bit overwhelming, and though it is apparently meant to be exciting and breath-taking, it comes across as a simple genre piece rather than a work deserving of the attention it is receiving from the public. I just expected more – more realism regarding an extremely important ecological issue that can cost us more than we can ever expect to salvage. Honestly, Ms. King’s words have been a mantra for me more often than not these days. In this era of “50 Shades of Gag Me With A Spoon” I have been not only distressed, but horrified by the state of literature written by women. Not all women, of course. I have read, and reviewed, several books by women authors which are exceptional. However, the exceptional has been overshadowed by the inane and senseless. It is heart breaking. Then, just when I despaired, something wonderful happened. 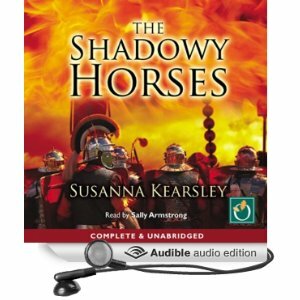 I listened to The Shadowy Horses. Written by Susanna Kearsley, and narrated by Sally Armstrong, this book should be on every bestseller list in existence. If you haven’t read it, I highly, Highly recommended the audio edition. Sally Armstrong has a beautiful, lyrical voice which turns the smooth prose of Kearsley into pure poetry. Kearsley’s story is set in Scotland as is well described in the blurb for the book and in other reviews. The story follows archeologists at a dig at Rose Hill, or, in old Latin, “Rouges Hill” a name which will come clear as the story unfolds. The voice of the book is beautifully paced, and draws you into the world of both modern and ancient Scotland, introducing the people both gently and with true understanding. Some are good, some not so much, but the people and the land are, above all, truly well written and make you feel that you are actually being drawn into the story. This is a beautifully designed tale. The main storyline concerns an ancient mystery – what really happened to the Legio Nona Hispana, the 9th Spanish Legion of the Roman Empire. The last testified activity of the Ninth in Britain was reported during the rebuilding in stone of the legionary fortress at York, or Eboracum in 108 AD. After that, the 9th disappeared into the mists of history. Did they simply disappear in Britain about 117 AD? Were they slaughtered during the war with the Parthenian Empire much later on? The only known fact is that they were nonexistent during the reign of Emperor Marcus Aurelius. What truly happened to these thousands of strong, well trained Roman Legionnaires? Kearsley builds on the stories and the mystery of the infamous 9th, following the theory of Miles Russell of Bournemouth University who has theorized that, “by far the most plausible answer to the question ‘what happened to the Ninth’ is that they fought and died in Britain, disappearing in the late 110s or early 120s when the province was in disarray”. And Britain was, indeed, in disarray. For all the control and training of the Romans, Britain was not easily taken or controlled. Did the “savage” tribes of Britain really destroy a formerly invincible army? While others seem to have reviewed this as a “romance” this is absolutely not how I understood this beautifully written novel. Yes, there is a bit of romance, boy gets girl stuff. But that is such a small portion of the overall tale. This is a tale of mysteries, of history and culture and beautiful, beautiful words. Of an ancient land and ancient peoples, brought into the modern day through the use of story and theory woven into a ghostly tale of the horrors of a brutal time in history. Of love of family, the bonds of friendship in times of war, and the length one man will go through to protect and honor his friend and his family, though death take all. This is, again, a beautiful and fascinating story for many reasons. I have visited that area of Scotland, and would do so again – only if I were to go back, it would be very hard to drag me away again. The history of the British Isles is rich and varied, brutal and savage, and deep as any Scottish Loch. And it calls to my heart and soul, a siren song of longing which I am loath to deny. I would wish you to know the beauty of those lands and its stories . . .
Reason sits firm and holds the reins, and she will not let the feelings burst away and hurry her to wild chasms. The passions may rage furiously, like true heathens, as they are; and the desires may imagine all sorts of vain things: but judgment shall still have the last word in every argument, and the casting vote in every decision. “A Jury of Her Peers: American Women Writers from Anne Bradstreet to Annie Proulx” by Elaine Showalter. This is an exceptional overview of true women’s literature. Stories of and by women with strength, intelligence, knowledge, and heart. Women who offer truly discriminating taste in literature. Only three, as there are three installments in James. Once you have read and reviewed three of these books, I encourage you to go back and read “50 Shades” again. Then, post another review of E.L. James in light of your three chosen Nobel Laureate books. Reviews should be posted here in this group. They may, of course, be posted to other sites, including Amazon. Reviews to be submitted by APRIL 1, 2014. That is a book a month, certainly achievable if you are interested in this challenge. A poll will be posted in order to choose your favorite “hate it” and “still love it” reviews. Prizes will be awarded! And for those who really only read erotica, you can choose books by the authors suggested by D.S. From LA if you have read this post here on my website! Are YOU sure enough of your literary assessment of James’ work to meet my challenge?